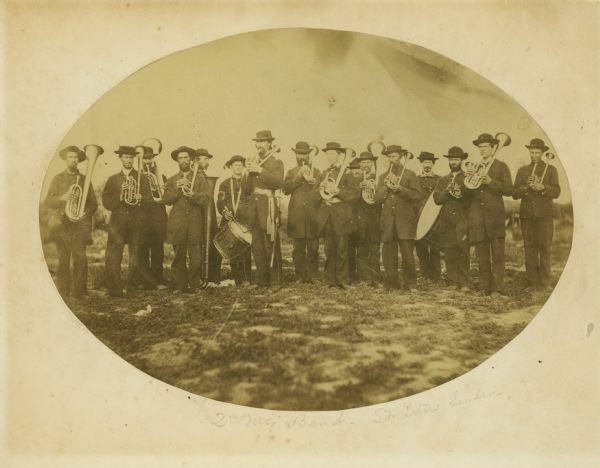 The brass band of the 2nd Wisconsin Infantry. In the past the leader in the picture was identified as Hazard W. Titus, but Titus did not become leader until May 1862 when the band became much smaller. Deemed too expensive, the War Department began discharging military bands in November, 1861. It is more likely the leader shown here is band's first leader, Homer S. Chandler, who resigned in October, 1861.